You have a lot of choices to make when you set up email campaigns, including what to use as your From email address. You’re welcome to use free email services like Yahoo and Gmail with Mailchimp if that works best for your business, but there are a few limitations you should be aware of. In this article, you'll learn about the limitations of free email addresses, what Mailchimp does to help, and alternative options. The primary cause of limitations with free email addresses is that you don’t own the domain, so you don’t have any control over its delivery policies. Free email addresses can’t be added to your verified domains in Mailchimp. Free email domains have policies in place that can cause delivery issues. These are meant to prevent email scams, but can still cause problems for legitimate marketers. This sounds scary, but Mailchimp offers a way to help. There are also lots of options for paid domains (yourcompany.com) that don’t have the same issues as free email addresses. We encourage you to weigh your options and decide whether a free or paid email address is best for your business. Read on to learn more about delivery issues with free email domains, or skip to the solutions section. To understand the problem with free email domains and delivery, it helps to have some background on DMARC, which stands for Domain Message Authentication, Reporting, and Conformance. 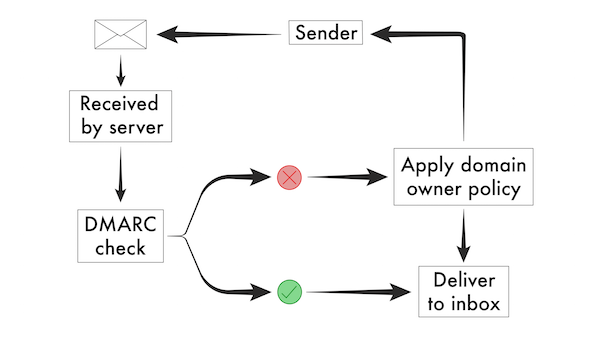 DMARC is basically a validation system for incoming email. It checks that the domain in a message’s From email address matches the domain the message is actually being sent through. If the domains don’t match, the email fails the DMARC check. Domain owners can set DMARC policies that tell receiving servers how to handle mail that appears to come from their domain, but has failed the DMARC check. Often, free email domains have policies that tell these receiving servers to immediately reject mail that fails DMARC. The mail is then returned to the sender. The intention of these strict policies is to prevent email scams, but it can also affect the delivery of legitimate marketing content sent through bulk email services like Mailchimp. If you want to continue using a free domain for your From email address in Mailchimp, we have a way to help ensure your campaigns are delivered. However, we can’t guarantee you won’t run into an issue at some point, so we encourage you to consider registering a private domain if you can. Here’s a bit more information on each of these options. If you use a free domain that could be problematic, we’ll make a small change to your From email address each time you send. All the changes are on our side, so you can keep using your free email domain without doing anything extra. Replies to your campaigns from subscribers still go to the From address in your audience settings. We’ll use either send.mailchimpapp.com or mail.mailchimpapp.com as the from domain for your email address when you send. When receiving servers look at your campaign, the From email address will match the domain the email is being sent from, so it should pass a DMARC check. If you input a free domain as your From email address in Campaign Builder that could be problematic, we’ll notify you about this change. This solution will help a lot of the time, but it can’t fix all delivery issues. If this doesn’t sound right for you, there are plenty of ways to purchase a domain or business email. That way, we won’t make any changes to your From email address, and you can avoid certain delivery issues. We strongly encourage you to consider purchasing a domain to use for your business email. You can use your registered domain in your email and other marketing channels, and on your website. This helps make your entire online presence more recognizable to your audience and may improve delivery of your email campaigns. To learn more about registering a domain, take a look at this article.